The Scoop: Some promotional efforts can be so in-your-face and impersonal that people just tune it out. Banner ads may be enough to convince someone to buy a dustbuster or a pair of fuzzy socks, but when it comes to more weighty decisions, like joining a dating site, sometimes people want a more trustworthy vote of confidence than a flashy billboard. That’s why Neumate plans to spread the word about its community-oriented dating site by engaging people in face-to-face conversations with promoters. The dating site will pay 50% commissions to NMPromoters whose referrals lead to a purchase. The promoters will hand out customized promo codes and earn money when the referred singles make a purchase on the dating site. In the coming months, Neumate plans to use its new promoter platform to expand its reach and create a grassroots dating movement unlike any other. The gig economy is a fast-growing sector with a lot of potential. Today, many ambitious individuals have given up their traditional 9-to-5 jobs and become freelancers with a lot more flexibility. CNN Money reported in 2017 that 34% of the workforce (about 4 million people) are gig workers who make a living by doing multiple side jobs. Neumate executives see all those people as the perfect partners for a word-of-mouth marketing campaign. Many independently-owned dating sites spend their marketing budgets on paid media, advertisements, or affiliate programs. Neumate went a different way. This one-of-a-kind dating site has opted to launch a revolutionary referral system that empowers everyday individuals to earn extra cash by telling people about Neumate. Based in Houston, Neumate is enlisting a local army of side-hustlers to spread the word about its online dating community. The team has launched a website, promote.neumate.com, to monitor its promoters’ referrals and pay commissions for purchases made using their custom promo codes. This ingenious system promises to increase Neumate’s visibility and reputation in a personal and organic way. Instead of following the usual online dating playbook, Neumate has once again rewritten the rules and expanded what a dating site is capable of. The entrepreneurial team has designed a system that will support local gig workers, increase the brand’s name recognition, and build its database through face-to-face conversations all at the same time. Neumate’s referral system will rely on people on the ground to promote the site, but that doesn’t mean they’ll take just anybody. It’s not meant for noncommittal unemployed folks who spend most of their time at home. It’s a chance for serious individuals to make a substantial amount of money by tapping into their social and professional networks. The Neumate team will review and approve all people who apply to become Neumate Promoters (NMPs). All applicants must submit a valid driver’s licence, and the team may request an online or phone interview to ensure the person is serious about coming on board. The team is looking for intelligent, driven, and well-connected individuals who talk to a lot of people often in their everyday lives. An Uber driver, for instance. Neumate plans to specifically target the rideshare network and recruit drivers to promote the dating site to their passengers. Drivers basically spend a few hours a day with a captive audience, and the relaxed environment makes it easy to start a conversation and recommend Neumate. Neumate’s team has come up with a marketing strategy that redefines how a dating site operates. NMPs can generate a unique promo code to give out to anyone who’s interested in joining the dating site. The NMPs can create the code on their smartphones and then either write it down, email it, take a screenshot, or text it to the potential Neumate member. Or they can keep a stack of Handout Cards to give out like business cards. These cards can be mailed to the promoter for free. Once a person uses a promo code generated by an NMP, that person will receive two free tokens on Neumate. If the member later makes a purchase on the dating site, the NMP receives a commission for making the referral. The commission is 50% of the member’s first purchase. 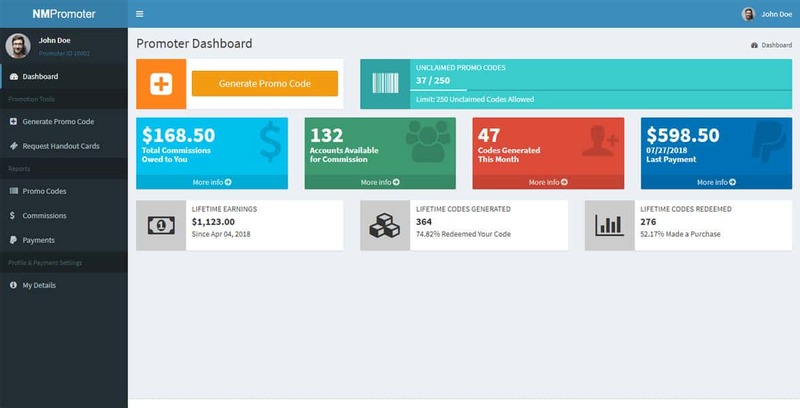 NMPs can track their progress on their Dashboard, which highlights how much money they’ve earned, how many codes they’ve generated, and how many accounts available for commission they have connected to them. Neumate too can review this data and determine how effective and trustworthy an NMP is. Promoters do not have to be members of Neumate to earn commissions. They just have to be energetic and personable individuals with access to a broad network of single people. Neumate’s team is on a mission to improve the online dating landscape one conversation at a time. They have built a streamlined dating site where local singles can feel confident and comfortable while chatting people up and planning dates. 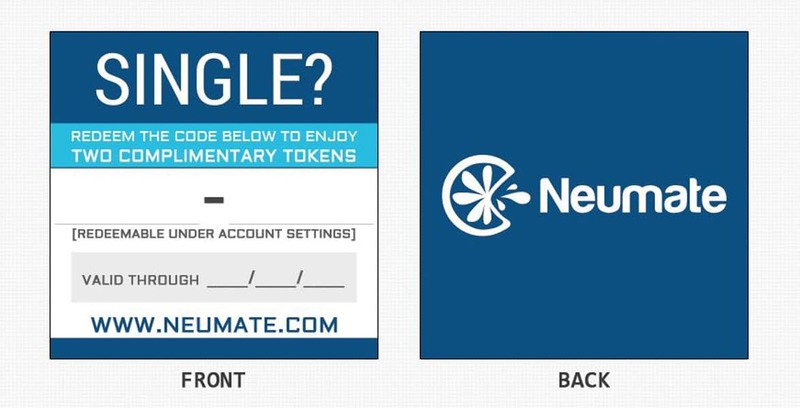 Now Neumate is focused on spreading the word while rewarding both local promoters and members. In recent months, Neumate brainstormed and developed a way to market its dating site by building affiliate relationships with local freelancers rather than faceless companies. The NMPromoter system is an efficient and modern way to tell people about the dating site without being intrusive or bombarding them with ads. Neumate Promoters can generate a promo code to give singles an incentive to try out the site. The dating site will use the power of face-to-face conversations to engage the community and create a buzz about Neumate. The team has started putting their money where their mouth is and trusting ordinary individuals to help them grow the brand to its potential. Whether the NMPromoter is a Lyft driver or a barista at a local coffee shop, they can earn extra cash simply by using their connections or foot traffic to get people interested in giving Neumate a try. Backed by a passionate entrepreneurial spirit, Neumate is on course to change the dating industry one conversation at a time. Thanks to companies like Uber, Airbnb, and Fiverr, the gig economy has never been stronger. Ambitious individuals can use high-tech tools to find plenty of opportunities to earn a buck, and now Neumate is getting in on the action. Its groundbreaking promotional efforts have the potential to benefit both the dating site and its supporters. The referral system is basically a win-win. Side hustlers have a way of putting more green in their bank accounts while Neumate fosters a transparent, natural, and value-driven way to raise its profile in targeted communities. As far as marketing strategies go, this one is pretty far outside the box; however, such a dynamic approach to online dating could yield big payoffs in the months and years to come.